Gain a deeper understanding of your data with easy-to-use analytics. Interact conversationally to explore and visualize business insights. Data is all around us. Discover what your data is revealing to you. Spot trends and patterns and gain instant insight. Interact with data conversationally. Turn those seemingly endless spreadsheets into a story with one-click data visualizations. Test correlations, discover relationships, and get meaningful answers. Ask questions and get recommendations using the common terms and phrases you use on a daily basis (Natural Language Processing). Guided interactive discovery in natural language can deliver deeper and smarter insights than data visualization alone. Your understanding and experience impact the way you collect, analyze and report on data. Misinterpreted or incomplete data can lead to unintended consequences and hide the real drivers of your business. Built-in algorithms and predictive models automatically find relevant insights for you. With automated discovery and analysis, you will never have to know what to ask, reducing the opportunity for bias to influence your results. Access structured and unstructured information from all the sources you need in one place. Expand your view when combined with sources, like weather, social, and geospatial data, along with built-in connectors, so you can have a comprehensive view of your business. Bring your insights back into your business and drive decision-making for greater impact. 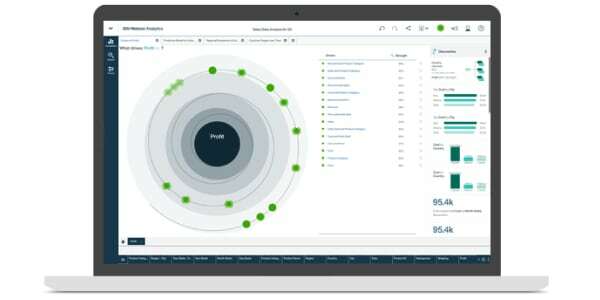 Uncover the "why" of what happened in your business with deeper, objective insights from IBM Watson Analytics, an interactive experience unlike any other data visualization tools. Natural language guides you to hidden patterns in your data in mere minutes. Automated exploration, modeling, and predictive capabilities, combined with sources like weather, social, and geospatial data, prepares you to answer the “why” better than ever before. Social intelligence and analytics technology that helps you achieve a holistic view of consumers, your market and competitors—all from millions of online sources. Become more analytics-driven with an integrated solution for all your managed reporting, dashboarding, and self-service analytics needs. Empower people to work with data and find their own answers within a governed framework. Planning, budgeting, forecasting and multidimensional analysis—powered by IBM TM1. You don't have to be a magician to turn information into visual insights. Learn how data's bad reputation is debunked, with 10 ways you can apply data to achieve improved business outcomes. Hidden insights can help you explore new ways of doing business and make better plans for confident growth. Watson Analytics takes away the hard part of uncovering insights and leaves you wondering, "Is this magic?" Insights can tell a more meaningful story. Discover connections and relationships you never knew existed, and create data visualizations automatically, to bring it all together. In order to deliver a top-notch on-campus experience, MSU Residential and Hospitality Services uses an IBM smart data discovery solution to understand how students and guests use its facilities, helping it fine-tune operations. IBM Cognos Analytics is helping companies confidently face the next data-driven industrial revolution by placing traditional business intelligence in the much more powerful context of modern data analytics and a sophisticated analytics strategy. The best ads don’t just sell products, they build relationships between your brand and your customers. Hydra Consulting is using social media analytics to understand how some ads engage viewers’ emotions, while others fade into obscurity.